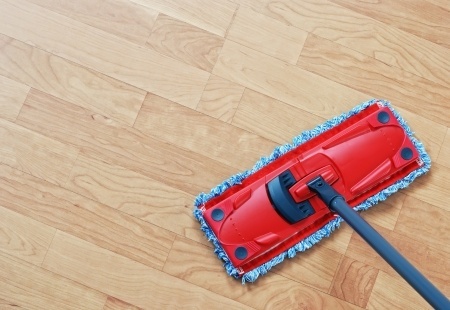 Keep laminate floors luxurious by regularly vacuuming, dust-mopping, or wiping them with a damp (not wet) cloth. When the dirt and grime get tough, as they often do in the kitchen, those who don't mind a bit of scrubbing will find that a solution of vinegar and water works well for cleaning laminate floors. To remove tough spots or stains, buff the blemish with acetone nail-polish remover, then wipe it clean with a damp cloth. 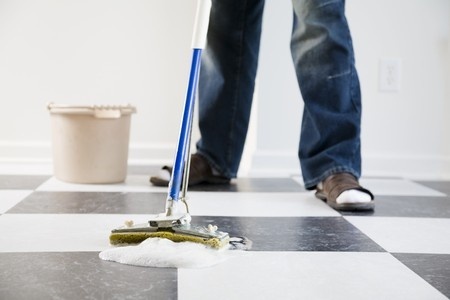 Here's the full routine for cleaning laminate floors. Use welcome mats. Grit is a laminate floor's worst enemy. Use furniture casters. Laminate floors cratch easily. Vacuum often, using the soft brush attachment on the vacuum. Do not polish, wax, or use steel wool or abrasive cleaners. Keep laminate floors luxurious by regularly vacuuming, dust-mopping, or wiping the with a damp (not wet) cloth. When the dirt and grime get tough, as they so often do in the kitchen, those who don't mind a bit of scrubbing will find that a solution of vinegar and water works very well for cleaning laminate floors. To remove tough spots or stains, buff the blemish with acetone nail-polish remover, and then wipe it clean with a damp cloth. No-nos for laminate floors include allowing water or a cleaning solution to stand on or below the surface of your laminate floor, and using soap-based detergents or mop-and-shine products (they'll leave a dull film on your floor), wax, polish, abrasive cleaners, steel wool, or scouring pads that will scratch the surface of your laminate floor.